Miss Pauline began teaching in July of 2003 following in the family footsteps. After teaching for two years, Miss Pauline returned to college to study Music Therapy and earned her licensure. (Please note that the services I offer are not Music Therapy, though you may find them to have therapeutic value.) In 2017, she became a “music parent” too with the birth of her son! I have been sharing my love of music with my son from the very beginning; because music is an essential part of life. One need only observe a baby to see that music is hardwired into our mind, body, and soul. I am grateful for the path my life has taken that I can help create musicians. I hope to help you on your own personal journey with music! I believe that music heals us as people and through music we can create a better world. 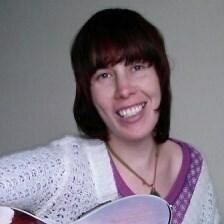 Miss Pauline teaches piano, guitar, ukulele, recorder, and voice. All ages and levels are welcome in the studio, as are all styles of music and musical goals. Miss Pauline has studied with Philip Zager, Howard Miller, Ted Jordan, and Susan Whitenack. In addition to teaching, Miss Pauline provides music therapy in nursing home centers. And, just to keep it interesting, she is a guide on the famed Ghost Tours of New Hope; reads tarot cards; Native American animal spirit totems; and has ten years’ experience in the field of therapeutic horseback riding. Request Lessons with Pauline today!